Haud yer Lugs Ceilidh Band is a lively,professional Glasgow-based group with a dance caller guaranteed to provide their guests with a great evening’s entertainment! The band has built an enviable reputation as one of the best Ceilidh bands in the country. Playing some of the top hotels and venues throughout Scotland. 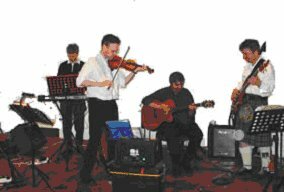 This band is an energetic four piece band comprising fiddle,keyboards,percussion and guitar and are all experienced and suitable for a variety of occasions including: graduation balls, weddings, dinner dances and Xmas Party nights. The band will play all the traditional favourite ceilidh dances like Gay Gordons, Dashing White Sergeant, Canadian Barn Dance, The Military Two Step and many more. They have an experienced caller who will go through all the steps if required – keeping everyone on their toes and up on the floor dancing! Credits include: Cameron House Hogmanay Band 4 years, Hilton Strathclyde Hogmanay 4 Years, Thistle Hotel, Hiltons, Marriott, Trades Hall Glasgow, Oran Mor, Scottish Swimming 4 years, Doubletree by Hilton, Crowne Plaza, Science Centre, Radisson, MacDonald Hotels & Trump Turnberry pus dozens of Weddings and Graduations every year If you like Ceilidhs this is a band not to be missed!